CTR’s rapid lithium extraction and production facility, Hell’s Kitchen Lithium is located within the highly active Salton Sea Known Geothermal Resource Area in Imperial County, California, USA. Adopting the project name from the iconic ‘Hell’s Kitchen’ restaurant that was previously built on the site in 1927, Hell’s Kitchen Lithium will revolutionize the way we source battery grade lithium products combining established rapid lithium extraction technology and geothermal power. The project’s available lithium products are estimated at 75,000+ tonnes per annum and will utilize 100% renewable base-load geothermal power. 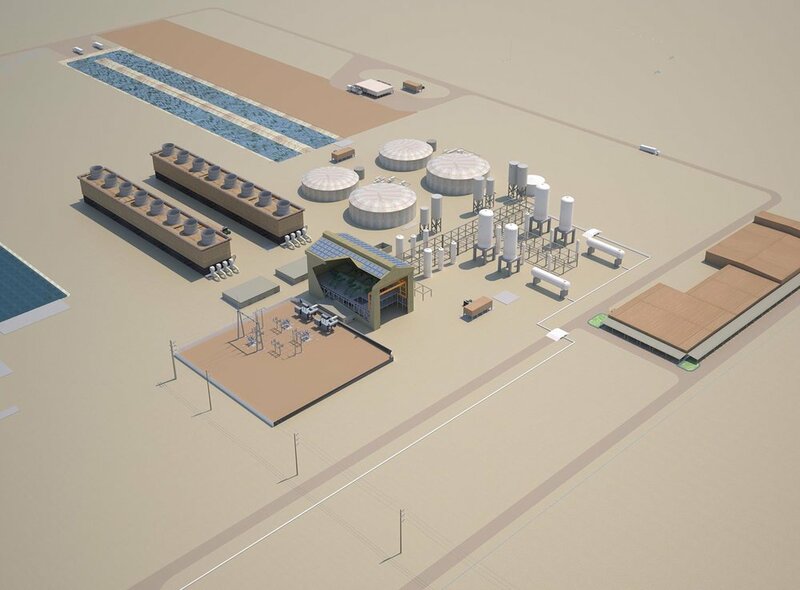 Powered by 100% renewable geothermal energy, the facility will extract lithium from mineral-rich geothermal brines using ion-absorbing liquid-liquid technology and utilizing heat to drive the extraction process. In comparison to ‘hard rock’ and ‘evaporation pond’ mining methods, the rapid extraction process takes hours, not months to produce battery-grade lithium products; significantly reducing operating costs while eliminating weather dependency and negative environmental impacts. Further benefits include a small production footprint, greatly minimized water usage, and reduced use of chemical reagents. Direct access to rail, road and established infrastructure will ensure Hell’s Kitchen Lithium is the most environmentally advanced lithium extraction and production facility in the world today. Opportunities for battery manufacturing companies to co-locate onsite will further enhance a seamless and secure materials and battery product supply chain. CTR has commissioned industry experts in lithium extraction, environmental and social compliance, and engineering to develop the NI 43-101 Preliminary Economic Assessment Report (“PEA”) due for completion in Q2, 2019. Stage 1 drilling and the construction of the pilot plant will follow in 2019. The CTR team expect to deliver Stage 1 LCE production in 2023, having secured long-term lease holdings inclusive of all mineral rights. CTR’s minerals and geothermal resource assessment (NI43 -101) has verified a robust and long-term resource. Hell’s Kitchen Lithium will be developed in modular stages of 15,000 tonne LCE ‘units’ to meet demand, ultimately producing 75,000 tonnes LCE per annum. CTR has the capabilities and resources to expand the development in 3 additional phases providing a total resource capacity of more than 300,000 tonnes of LCE per annum. Hell’s Kitchen Lithium is located within the boundaries of the Salton Sea Known Geothermal Resource Area (SSKGRA) in Imperial County, California, USA. CTR has secured all land and subsurface mineral rights within the leasehold area. *Power estimate assumes triple-flash CRC process with bottoming cycle. The Salton Sea Known Geothermal Resource Area (SSKGRA) has been well documented since 1982 with successful geothermal projects operating in this highly active area for over 30 years. The Hell’s Kitchen lease and operational location is an extension of a proven geothermal field. Supported by Federal, State and Local Government agencies.